Created by Dr. John Matthews back in 1969, the Newport Corporation was among the first to harness the power of a laser for industrial applications. Dr. Matthews was an engineer with a Ph.D from Cal Tech and had a passion to become the leader in the industrial laser market. John was also passionate about hunting and shooting. He always wondered if he could adapt the laser technology to his firearm. In 1979, John’s concepts became a reality and he designed the laser sight. A few years later, he was asked to help the Los Angeles Police Department’s SWAT Team in the 1984 Olympic Games. They needed his laser on their guns. Measuring just 5.4 inches long with a one-inch bezel, the E2D Defender is an innovative, well-designed compact flashlight, handy enough in its normal use as a tool, with integrated self-defense features that set it apart from the crowd. It is ruggedly constructed and feels hefty in the hand, which always helps to bring authority to your actions if it’s called upon in a tough situation. Surefire manufactures the E2D from military specification hardened aluminum. The precision-machined body is thick enough to keep the light safe from disasters like drops, high-energy impacts like bullet or knife strikes and the occasional Monday morning when you realize you just parked your pickup on top of it. The lens is tempered glass, coated with a material that helps to keep the lens clear. The dual-mode LED bulb has a two-way switch in the tail cap, with a blinding 200-lumen output on high and an energy-conserving 5-lumen setting for working with maps or checking gear. Both the tail cap and the head use O-rings for weatherproof sealing. Surefire offers the E2D Defender in black and olive drab. This particular light goes beyond the normal pale, to offer features that most flashlight designers have never even considered. For instance, the bezel features a crenellated design called Strike Bezel, with six machined protrusions around the bezel’s circumference. Each protrusion has a tapered tip similar to that of a screwdriver. In a situation where an attacker is lunging forward, the soft tissues on the torso are often unavailable for impact. However, with the E2D Defender gripped firmly in fist, it’s possible to defend and attack simultaneously by raising an arm to block and striking the assailant smartly on the forehead to stun him at the same time. A strike anywhere on the arm, shoulder, chest, abdomen, leg, testicles or even foot would be very painful and probably just as effective. As if that feature isn’t enough, Surefire designers had enough foresight to provide a similar feature on the tail of the light, with scalloped edges machined into the tail cap. This means that no matter which direction you are holding your light, there’s a weapon at the ready to aid in self defense. No flashlight is perfect, and the Defender could be improved. Although the light includes an integral pocket clip, it’s not reversible. In a pocket, the lens is pointing straight up, and there are many times while checking equipment, using keys, radios and the like when it would be handy to clip the light with the lens facing down. Another caveat is bulb replacement. Surefire makes you replace the entire head of the flashlight instead of just the bulb. One idea is an accessory head that lets a user replace the bulb in that head after purchasing it. Once everything is considered, this light provides quality construction, thoughtful design and reliable operation. Surefire offers a nice line of accessories for the light, including colored lens filters, trigger adapters for firearms, holsters, carriers for spare parts and more. The self defense features are just the icing on the cake. 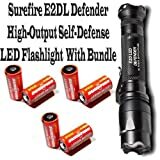 The Surefire E2D LED Defender comes highly recommended. Fits our V91 holster in the head-up position. Surefire also makes an ULTRA version of the E2D LED Defender. The E2D LED Defender Ultra is a compact 500-lumen flashlight featuring dual-output capability and self-defense enhancements. Utilizing a virtually indestructible high-performance LED and a Total Internal Reflection (TIR) lens, the E2DL Ultra is activated with a pushbutton tailcap click switch that also selects output levels: press or click once for a high-intensity 500-lumen white-light beam—ten times the light needed to overwhelm the night-adapted vision of an aggressor. Return to off and press or click again within two seconds for a 5-lumen ultra-long runtime low beam that’s suitable for navigating at night or performing close-up tasks for hours. The Defender’s crenellated Strike Bezel provides further defensive options should the need arise. Slender and powerful, the E2DL Ultra is an ideal everyday-carry light.